This former gamekeeper’s cottage, built in 1896, lies up a peaceful glen in the Galloway hills. Here you are away from traffic noise and street lights, and on a clear night see the stars. The garden is a haven for birdlife and red squirrels . A short distance away are the many attractions of the area, with something to offer for all ages. 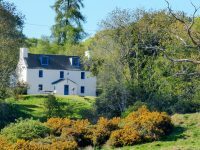 The tastefully modernised cottage has been refurbished to retain its original character and features, making it a comfortable family holiday home. It is approached from the Skyreburn road up a short track, through the field beside the cottage to a large fenced car parking area. The small Paradise burn is at the rear of the cottage, through a gate with a secure latch. The beautiful Solway coast is just under three miles away, with superb beaches for swimming and watersports, and there are many golf courses to be enjoyed. Hill walking is on the doorstep and there are many hill lochs for fishing. 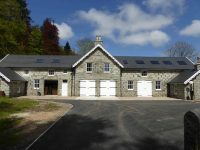 Galloway Forest Park has the well known 7 stanes Mountain bike trails at Kirroughtree and is also a designated Dark Sky Park, while nearby Laggan Outdoor has one of the longest zipwires in Europe, and Cream of Galloway, makers of delicious ice cream, have an adventure playground for all ages among its many activities. Nearby Creetown, reached further up the Skyreburn road has the Gem Rock Museum. Gatehouse of Fleet, 4 miles away, Kirkcudbright, the “artists’ town”, and Castle Douglas have excellent pubs and cafes, and are known for their food shops and galleries. There are also many interesting gardens and popular National Trust properties to visit. 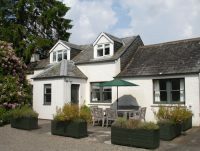 Good home cooking can be collected from The Scottish Pantry Catering, King Street, Castle Douglas. Both Tesco and Majestic Wines deliver to Rowantree. Rowan Cottage is a lovely terraced family house with a large enclosed garden. Cosy in winter and cool in the summer. In a convenient location it is within walking distance of shops, restaurants, pubs, golf course, bowling, and tennis court. Forest walks and beautiful sandy beaches are within easy reach. The tourist town of Gatehouse of Fleet sits in the centre of the Fleet Valley National Scenic Area, at the head of the Fleet Estuary. Watched over by the 15th Century Heritage Site of Cardoness Castle, it nestles between a coastline of sandy beaches and the gentle Galloway Hills. Located in Bladnoch in the Dumfries and Galloway region, Rowallan features a garden. The accommodation is 23 miles from Stranraer. The holiday home is equipped with a TV. Set amidst the peace and tranquillity of the beautiful Scottish Machars Peninsula, Ravenstone School Hall offers the perfect rural retreat. Built in the late eighteen hundreds the School Hall is a listed building of important historical interest, which at its peak catered for 74 pupils from the surrounding farms. Nowadays, the hustle and bustle of yesteryear has been replaced with a warm, tranquil ambience. Refurbished and decorated to a high standard throughout, the School Hall offers the ideal cosy hideaway and provides homely self-catering accommodation. The accommodation consists of a Victorian tiled entrance porch and inner hallway with a large open-plan lounge and kitchen area, which was formerly the main classroom and contains the original oak paned classroom dividing wall. This forms a wonderful light and airy space, perfect for dining, socialising and relaxing. 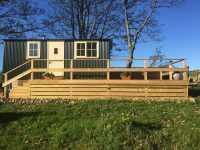 There is a luxury bathroom with separate bath and shower cubicle and an additional utility area with washing machine, tumble dryer and table top freezer. There are two king-size bedrooms, one which is on the ground floor and the other at first floor level which is equipped with a balcony overlooking an open expanse of fields. A small ground floor room can store two pedal bikes and is also where the garden furniture is stored. For those with an interest in astronomy, the area was awarded one of the best dark sky areas in the world to see the night sky. There is a gravelled area at the rear where guests can sit out and relax in the tranquil atmosphere. The School Hall offers the perfect blend of both original charm and character whilst providing all modern conveniences. For keen cyclists there are lots of superb places to venture or for those with mountain bikes, the Kirroughtree mountain biking centre is a must. Delve into history at the historic Whithorn Priory or linger over a book and coffee in Wigtown, Scotland’s official Book Town. Enjoy one of the many spectacular gardens that flourish in the unique climate in this part of Scotland or take the ferry to Ireland for a day. It forms an ideal base to explore all that the local area has to offer. 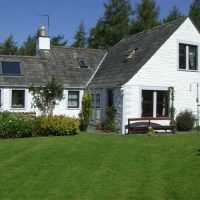 One of a pair of delightful cosy semi-detached traditional Galloway Cottages in Borgue graded 4 star by Visit Scotland. Tucked away in a secluded position surrounded by stunning rural scenery, with beautiful open views across open farmland to the sea in the distance. The surrounding area is teeming with an array of wildlife and is a ‘Twitchers’ paradise. 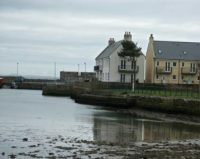 There is much to see and do in the area and, apart from Brighouse Bay there are plenty of sandy beaches and coves within a few minutes’ drive. 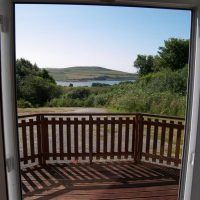 The cottage is a few minutes’ drive from Brighouse Bay Holiday Park which has a bar and eating facilities, several leisure activities including a swimming pool and a superb cliff top golf course. The area has wonderful sporting facilities including game, sea and coarse fishing. Kirroughtree, part of the Galloway Forest offers a stage of the 7stanes Mountain Bike trail, with others a little further afield at Dalbeattie, Mabie & Ae Forests. There are numerous opportunities for walking be your preference for beach & cliff top walks or more strenuous hill walking. Golfing is available at Brighouse Bay or there are numerous courses within Dumfries and Galloway all within easy reach. The nearest town, Kirkcudbright, ‘The Artists Town’, has a number of interesting galleries, Broughton House and Garden (National Trust for Scotland) and a busy working harbour and marina. 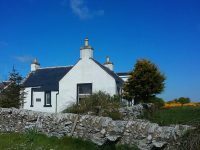 Chapelton Cottage No 1 is attached to this cottage and, for larger parties, the two cottages could be booked together. 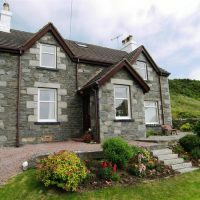 A wonderful family holiday cottage with excellent sea views close to one of South West Scotland’s outstanding beaches at Brighouse Bay. 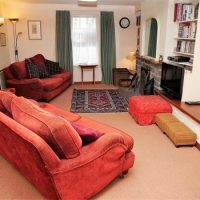 The cottage sleeps six and is equipped to an excellent standard. Brighouse Bay is a quiet sandy cove with superb views over the Solway to the Lake District and also the Isle of Man. It provides a safe haven for swimming and sailing while there are of course rock pools to explore as well. Other excellent beaches are also available close by at Carrick Bay and Sandgreen to provide more variety. The local area is a superb base for cycling with quiet country roads or strenuous mountain bike trails in the Forestry Commission Woodlands, the 7Stanes routes are all close by. The coast line is well worth exploring with rugged cliff walks and open beaches whilst the Forestry Commission Woodlands and Galloway Forest Park are also close by providing excellent opportunities for watching wildlife and also, on dark nights, stargazing with the Galloway Forest Park being one of the country’s first Dark Sky Parks. The busy harbour town of Kirkcudbright is only five miles away. The town has a very active Artists community and has an annual art gallery exhibition frequently showcasing works by Monet and other well-known artists. There are local artists’ studios which are open to the public and worth exploring. Within the town there are varied independent shops which are worth investigating for local produce and crafts. Slightly further away, Castle Douglas also provides an interesting town to discover and both Castle Douglas and Kirkcudbright have good hotels, restaurants and pubs for eating out. For rainy days the nearby Brighouse Bay Holiday Park has a swimming pool which is open to the public and there also numerous historic sites of interest worth exploring including Kirkandrews Church which is one of the smallest you are ever likely to find. Dunrod, graded 3 star by Visit Scotland is in a superb elevated position with sea views across Brighouse Bay and within an easy walk to the sandy beach. 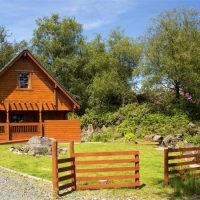 Dunrod provides an excellent holiday base with significant flexibility in the accommodation for either multi generation family holidays or large groups. It is ideally suited to those keen on outdoor pursuits with plenty of space for equipment and clothing. The surrounding area is teeming with an array of wildlife and is a ‘Twitchers’ paradise. There is much to see and do in the area and, apart from Brighouse Bay, there are plenty of sandy beaches and coves within a few minutes’ drive. 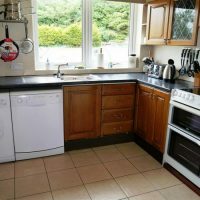 The house is situated close to Brighouse Bay Holiday Park which has a bar and eating facilities, several leisure activities including a swimming pool and a superb clifftop golf course. The area has wonderful sporting facilities including game, sea and coarse fishing. Kirroughtree, part of the Galloway Forest offers a stage of the 7stanes Mountain Bike trail, with others a little further afield at Dalbeattie, Mabie & Ae Forests. 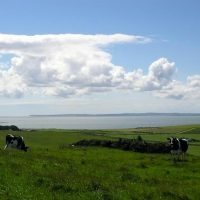 There are numerous opportunities for walking be your preference for beach & clifftop walks or more strenuous hill walking. Golfing is available at Brighouse Bay or there are numerous courses within Dumfries and Galloway all within easy reach. The nearest town, Kirkcudbright, ‘The Artists Town’, has a number of interesting galleries, Broughton House and Garden (National Trust for Scotland) and a busy working harbour and marina. 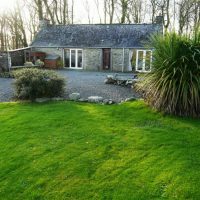 Clachanside is a delightful, well furnished semi detached cottage, near Gatehouse of Fleet with a small stream and its own large garden. Just a short distance from the large sandy beach at Sandgreen or rocky bay at Carrick and walking distance from Fleet Forest walks and picnic area. 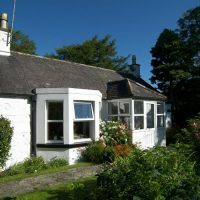 The cottage is adjacent to the Sustrans cycle Route 7 and is also within a half hours drive of one of the sections of the 7Stanes mountain bike network. Close to Gatehouse of Fleet for shopping, eating out, golf, fishing, bowling, etc – all the makings of a wonderful holiday. 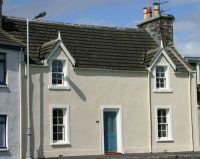 This former 1850’s Cornmill is a spacious 5 bedroom Bed and Breakfast in the small fishing village of Garlieston. Perfect for groups or friends to enjoy this amazing coastline in Galloway, South West Scotland. The Cornmill offers Bed and Breakfast** as well as Room Only for those who like to take things at their own pace. There is bike storage available; all rooms have TV’s, the use of wireless broadband and pets are welcome too. Fabulous in every season, this self-catering accommodation offers a warm comfortable holiday home for families and friends. A photographer’s dream – large corner windows in the first floor sitting room offer magical views of the historic MacLellan’s Castle, the picturesque harbour and river, plus, a unique perspective of Kirkcudbright’s lively, colourful, civic parades and celebrations. Holiday home of an artist and architect, the property has been in the artist’s family since 1913. Traditional Scottish and contemporary art adorns the walls. The ample kitchen/dining room was recently modernised and fitted to a very high standard as was the master bedroom and family bathroom. The three charming bedrooms and a cloakroom are on the top floor. Wifi is available throughout the house. 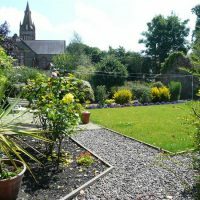 A surprising walled garden with lawn and patio is a safe, sunny place to relax or play. Fruits and flowers can be picked in season. Traditional shops feature fresh produce, as do the restaurants, pubs and cafes – all within walking distance. Stroll to interesting small boutiques, art galleries, the harbour and the town’s recreational facilities. Short drives to lovely sandy beaches, hiking and cycling trails, sailing, fishing, birdwatching and much, much more……. 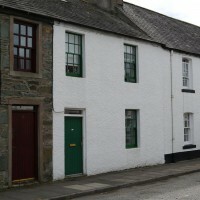 Offering comfortable and affordable accommodation for both couples and families alike, over two floors this traditional terraced town house flat is an ideal location in Kirkcudbright conservation zone and close to all facilities. The town is a superb holiday base on the estuary of the river Dee with much to do both in Kirkcudbright and close by. A short walk from the house is the National Trust’s Broughton House, Historic Scotland’s McClellans Castle and the romantic Greyfriars Church all together with the bustling life of Kirkcudbright Harbour and Marina with its wide variety of Art Galleries, Tea Rooms, Shops and places to eat. Kirkcudbright is a well-established base for art lovers and known locally as ‘Artists Town’ with many galleries and every summer a popular public gallery is open in the town hall exhibiting major art works. The town is well known for its abundance of summer events and activities for all age groups and has two golf courses. 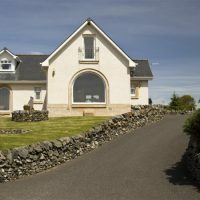 Outside the town there are two golf courses together with beaches within easy reach at The Dhoon and Carrick and the lovely market towns of Castle Douglas and Newton Stewart to visit. Enjoy exploring the beautiful Solway Coast and inland the Galloway Forest Park which is renowned for its outdoor activities including mountain biking, sailing, walking and wildlife watching with the well-established Red Kite Trail where you are guaranteed to see one of these fascinating birds. Cally Palace, on the outskirts of the pretty village of Gatehouse of Fleet on the Solway coast, is set in over 150 acres of grounds and was originally an 18th century country mansion just outside Gatehouse of Fleet but is now a wonderful hotel in south west Scotland. Entering through the oak doors, the grandeur of the interior is immediately apparent as step back to a time of period style and elegance while enjoying all the modern comforts of a four star hotel. Two huge marble pillars frame the entrance hall which leads to the Bow Lounge with its magnificent gilt cuppola ceiling. The hotels’ 56 bedrooms combine spacious accommodation with views of the estate grounds and the Dumfries & Galloway countryside beyond. Cally Palace has its own exclusive golf course, as well as an indoor leisure complex with swimming pool, to allow you to make your stay with us as active or as relaxed as you choose. The warmth of the Scottish welcome you receive will impress as much as the opulence of the surroundings. Cally Palace was originally an 18th century country mansion just outside Gatehouse of Fleet and is now a wonderful golf hotel in Dumfries and Galloway, Scotland. You can step back to a time of period style and elegance while enjoying all the modern comforts of a four-star golf hotel. The hotel’s 56 bedrooms combine spacious accommodation with views of the estate grounds and the Dumfries & Galloway countryside beyond. Cally Palace has its own exclusive golf course, as well as an indoor leisure complex with swimming pool, to allow you to make your stay with us as active or as relaxed as you choose. 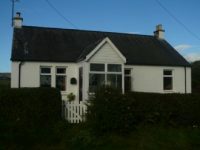 Fleuchlarg is a charming modernised cottage set in attractive landscape gardens with stunning views of the Fleet Valley. 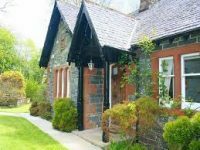 The cottage provides spacious family accommodation which is naturally light and has been carefully furnished and decorated to provide a charming family holiday cottage. The large garden is superb for active children and also has a furnished patio area and barbecue. The popular town of Gatehouse of Fleet is a pleasant 3/4 mile walk along a quiet country lane and has a good selection of hotels and cafes serving food, local shops including 2 mini markets, together with a play park and access to the famous Cally Woods which sport a superb array of bluebells in the spring. The local area is steeped in history and Gatehouse of Fleet itself has two popular attractions in the Mill on the Fleet and also Cardoness Castle. Other historic sites are within easy reach at Kirkcudbright and Castle Douglas. 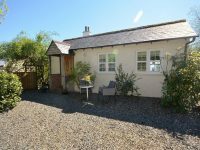 The superb Solway Coast with sandy beaches and excellent walks is approximately three miles away. Outdoor pursuits are almost too numerous to list but include good quality nine and eighteen hole golf courses, fishing nearby together with the Forestry Commissions 7Stanes Mountain Bike rides in the Galloway Forest Park. The Galloway Forest Park itself provides excellent walking and wildlife watching opportunities together with being one of the first Dark Sky Parks for stargazers. Ground Floor: Porch, sitting room, dining room, kitchen, outer kitchen, bedroom 1 and bedroom 2 and bathroom with shower room. First Floor: Double bedroom and bathroom with bath. The interior is filled with beautiful antiques, including a Scottish Lowland dresser, benches, chests, wardrobes, chairs and lamps. John Lewis beds, Cologne and Cotton linen and modern appliances, including dishwasher, fulfil the practical needs of everyday life. Abundant books, classical CDs, DVD player and magazines provide extra relaxation. The Gardener’s Cottage is part of the stable/garage block. A table tennis room is at the end of the courtyard next to the laundry/drying room where there is washing machine. The gardens of Carstramon House are largely for the use of the owners but guests may use the pretty courtyard where the cottage is set and the lawn immediately behind it. Situated in Gatehouse of Fleet in the Dumfries and Galloway region, Little Boreland has a garden. Guests may enjoy free WiFi. The holiday home is fitted with a TV and 5 bedrooms. 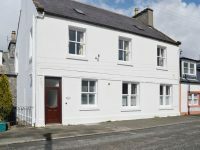 Situated in the charming town of Gatehouse of Fleet, this well-equipped terraced house with good sized rear garden is well situated to explore the beautiful Galloway countryside. Pubs, Hotels & Cafes are within walking distance. There are lovely safe sandy beaches nearby at Sandgreen and Mossyard suitable for swimming and water sports. There is excellent bird watching, with the Red kite trail within a short drive. There are plentiful opportunities for cycling including the Forestry Commission 7Stanes Mountain Bike Network trails, the nearest being at Kirroughtree & walking, whether it is cliff top, forest or hill walking. Golf and tennis are both close by. Fishing on river and lochs are also available locally in season. Leaving the main drive you swing right onto Orroland Lodge’s private drive and wind through mixed woodland, following a burbling stream with wild ferns, flowers and farm fields beyond. Here sleek cattle enjoy the succulent grass with enviable views of the sea. Rumble over your cattle grid and past the head of one of the paths leading to the shore. There’s still no sign of Orroland Lodge until the road sweeps round to the left and the Lodge emerges from the sheltering trees in all its glory. You have arrived at a holiday house that is large and impressive in appearance, offering accommodation that is very easy to live in. Listen for the ethereal sound of the sea in harmony with the birdsong; sounds that are totally unobtrusive and good for the soul. Enjoy the spacious, elegant and comfortable accommodation in this former shooting lodge. You can relax on the sheltered, sunny terrace and feast your eyes on the views across the Solway Firth to the Cumbrian mountains. All along the front of the house the rooms have uninterrupted sea views (there’s no such thing as a bad view at Orroland Lodge). You are a stone’s throw from the steep wooded slope leading down to the private rocky shoreline, where you will find driftwood to collect and rock pools and caves to discover. The large flat rocks are ideal for barbecues, picnics and sunbathing. Cliff and Betty assure guests of a warm welcome to their recently restored Grade B listed self-catering harbour side cottage overlooking Garlieston Bay. 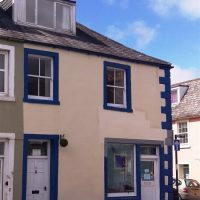 The accommodation sleeps up to four people in double and twin-bedded rooms upstairs with stylish, comfortable open-plan living/dining/kitchen area downstairs. To the rear of the cottage is a marine-themed garden and extensive parking. The cottage has recently received a Tripadvisor Certificate of Excellence along with the adjoining Slipway Cottage. 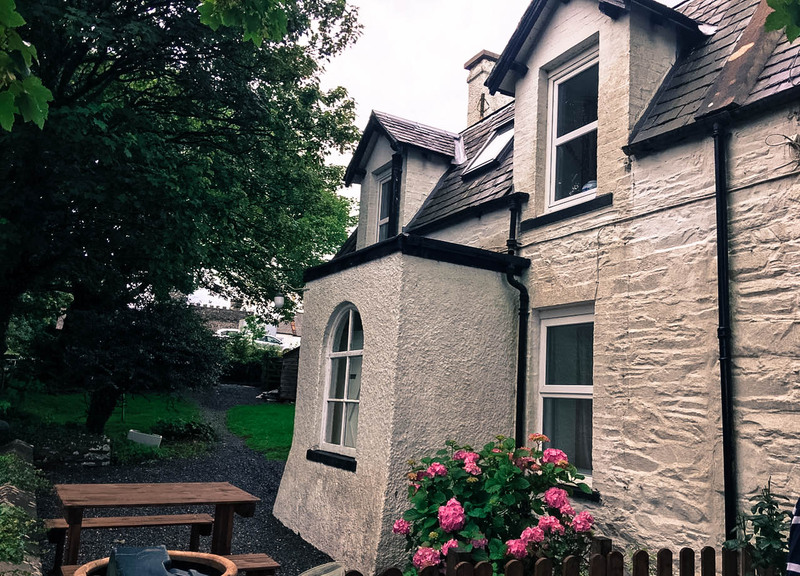 Anchor Cottage is nestled in the picturesque harbour village of Garlieston on the Machars peninsula in Dumfries and Galloway. 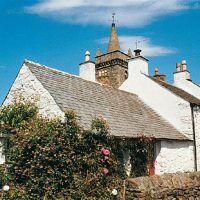 Just 32 miles from Stranraer, this former fisherman’s cottage is in a beautiful spot just yards from the sea, with magnificent views out across Garlieston Bay. 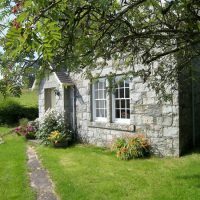 Just seven short miles from Wigtown, Cowgate Cottage in the seaside village of Garlieston offers very comfortable four-star accommodation. 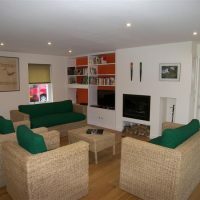 This excellent base, in the heart of the Machars, is equally cosy for 2 people and spacious enough for up to 6 people to enjoy. The property features wood-burning stoves, lovely views and quality, well-equiped interiors.